It is likely that the most basic everyday guideline for human behavior is to treat people as you would want to be treated if you were in the other’s position. In the United States, this guideline has been known as the “Golden Rule” since the 1800s. Many human troubles, conflicts and tragedies involve situations in which people could have acted according to the Golden Rule but, to their sorrow, they did not. Cultural examples of this in American history include the treatment of African-Americans, Native Americans, other minority groups, laborers and women. Most people can think of personal situations that would have been less stressful if the Golden Rule had been used. The material in this document conveys the universality of the Golden Rule. The presentation here was developed primarily for high school juniors and seniors (ages 16 to 18) to demonstrate that the Golden Rule is more than a behavioral guide for small children. However, many young people will be able to use it effectively prior to their last years of high school depending on their reading ability. Any young person who understands the words being used in this document can profit from this lesson plan. Moreover, this curriculum has relevance beyond the realm of public, religious and private schools. Sunday school teachers, home schooling parents, scout leaders, and other youth educators will find it useful (in whole or in part). The content of this lesson plan can also be utilized as a basis for constructing age-appropriate lessons. The authors of this document hope that the instructors themselves will be inspired as they teach young people the joys of making the Golden Rule a lifelong moral standard. In a very real sense, the Golden Rule provides us with the most universal standard of behavior that we have. 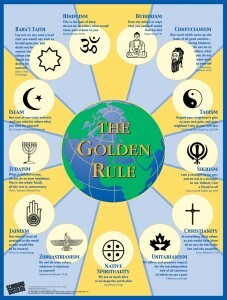 One can find variations of the Golden Rule in ancient writings from around the world. There are good reasons for the prevalence of the Rule across history. Consider the social nature of human living. We survive by living in groups and helping each other. Since people in a group are mutually interdependent, individuals are likely to treat others as they would want to be treated themselves. Otherwise, sooner or later the group will self-destruct or break up. That is to say, some sort of reciprocity within a group is an aspect of human behavior that is necessary for long-term survival. The earliest surviving written record of a Golden Rule statement goes back about 4,000 years–to the ancient Egyptian civilization. However, this kind of behavioral ideal would have been a human understanding long before that time, and it remains so today. There is a self-interest and self-preservation element in the Golden Rule, as there is in most things that people do; but that’s not the only reason that the Rule is commonly followed. Altruism is also a human trait. Altruism means that people care about others’ well-being even when there’s no possibility of a return favor. They simply feel good when helping others. Think of relatives who take in a child if its parents have been killed. Think of people around the world who have aided the Asian tsunami victims and those who have suffered from hurricanes and other natural disasters. The altruistic frame of mind that is fostered is significant–it shifts thinking from oneself to the welfare of others. Instead of thinking “what’s in it for me,” Golden Rule-minded people consider other peoples’ needs and desires–how other people will benefit (or at least not be hurt) by what one does. Such acts can be their own reward; they make people feel good about themselves–finding joy in doing things that make the lives of others a bit more pleasant. Moreover, Golden Rule thinking expands as our group identifications expand. Compared to previous ages, we have larger numbers of “others” with whom we now identify. At one time group loyalty–a sense of belonging–did not go much beyond the family, the clan, the band or one’s tribe. “Outsiders” were not to be trusted. Today we use “we/our” terms for huge groups, most of whose members are not personally known to us. For example, the vast majority of Americans are patriotic and regard the millions of other Americans as a part of “we/us”. And for many Americans, their loyalties extend far beyond the country’s borders. There are no outward limits to “we/our” feelings! We are far from realizing these goals, but there are reasons to be hopeful. That such a “Declaration” exists is an achievement, and actual progress is being made. Slavery still exists, but it is being challenged. Despite problems, the number of democratic governments in the world has increased. In many societies, women now have a larger measure of economic and political power than in past times. Young people are raised more humanely than in previous centuries; girls’ prospects for fully developed lives have greatly improved. The morality of the Golden Rule and altruism–considering the well being of others as well as our own–is a part of human nature. It is found worldwide and in all enduring cultures. One’s aspiration to live the Golden Rule needs nourishment, but it’s not dependent upon one being a member of this or that particular group, religion, or cultural tradition. “The Golden Rule” title itself seems to have come into general use in the early to middle 1800s in both England and the United States. Another early example of the title being used is “A Lesson From the Golden Rule” that appeared in the October 1853 issue of Godey’s Lady’s Book magazine. Godey’s Lady’s Book was rather typical of a number of women’s publications of the time. Personal ethics and teaching children to be moral were two of the concerns of the magazine. A straightforward, non-fictional reference to the Golden Rule in England comes from John Stuart Mill’s book,Utilitarianism, published in 1863. Mill says, “In the golden rule of Jesus of Nazareth, we read the complete spirit of the ethics of utility. To do as you would be done by, and to love your neighbor as yourself.” (The English Philosophers, 1939, Random House, p. 908) Utilitarianism was a widely discussed philosophy of the 1800s. From this period onward, “golden rule” (uncapitalized) appears with increasing frequency. Charles Darwin used it inThe Descent of Man published in 1871 (Chapter IV). By the end of the 1870s, the Golden Rule had become a children’s textbook lesson in the United States. The 1879Revised Edition of McGuffey’s Fourth Eclectic Reader had a story titled “The Golden Rule” (Lesson 51) that had been written years earlier by Emma Embury. These school texts were used by millions of children through to the end of the century and beyond. Harlow Unger, writing in the Encyclopedia of American Education, claims that these school texts helped establish America’s central ethical ideals. And these texts are still in print. Some home-schooled students and others in private schools continue to study from them (1996, Facts On File, Inc., Vol. 11, p. 588). A final note: During this general time period–the early and middle 1800s–the exact wording, “Do unto others as you would have them do unto you”, also became popular, apparently evolving out of folk tradition. Although many people assume that this way of stating the Golden Rule is ancient, even biblical, the phrase is not found in any classical reference or standard translation of the Bible. As noted above, the “Golden Rule” title seems to have come into use during the two decades before the Civil War. One early reference we found was from a ladies’ magazine, Godey’s Lady’s Book, October 1853, pp. 323-326.Godey’s was a widely circulated monthly magazine of the time, which, like others of that period, focused on literature, fashion, songs, recipes and household hints. Its “Lesson From the Golden Rule” was written by Louis Godey and Sarah Hale (using Alice B. Neal as a pen name). Godey had purchased Hale’s ladies’ magazine in 1837 and persuaded her to become editor of his magazine. The title of Godey and Hale’s story seems to indicate that there had been previous Golden Rule stories. One of these apparently was “The Golden Rule,” a story written by Emma Embury. Students may be interested to know that Sarah Hale wrote the ever-popular children’s poem, “Mary Had a Little Lamb,” and she also convinced Abraham Lincoln to make Thanksgiving a national holiday. Before the Civil War, the Golden Rule was clearly relevant to the issue of slavery and the treatment of African-Americans in the United States. For example, in 1791, Jonathan Edwards preached a sermon on slavery and Matthew 7:12 from the New Testament (in which Jesus expresses a variation of the Golden Rule). However, Edwards did not refer to that verse as the “Golden Rule.” Rather, he spoke of “the general rule given us in the [Bible] text” and this “divine maxim.” (African American Odyssey online). The authors of this lesson found Frederick Douglass’s use of the term “Golden Rule” because his 1842 speech was published. Most abolitionist speeches were not recorded. After the Civil War, the Golden Rule phrase had become so well known that the short story entitled “The Golden Rule” was added to the 1879 edition of McGuffey’s Fourth Eclectic Reader, as pointed out above. At that time William McGuffey had nothing to do with its insertion since he was no longer living but the publisher owned the right to use his name. The story itself had been written years previously by Emma Embury, a well-known writer and on the editorial staff of major women’s periodicals of her time, including Godey’s, Graham’s and The Ladies’ Companion. Embury’s Golden Rule story dates from before 1850 since by that time “a serious illness [had] ended her writing career.” (American Women Writers: A Critical Guide from Colonial Times to the Present, 1979, Lina Mainiero, Ed., Frederick Ungard Publishing Co., NY, Vol. 1, pp. 594-96) The publication in which her story originally appeared is not known to us. If people are equal in significant ways. If there is general agreement on what “good treatment” should be. If there is reason to believe the person wants to be treated as one would if one were in his/her place. If one personally wants to be treated in relatively normal, humane ways. If there is a reasonable hope that one will be treated well in return. If one is not in a “kill or be killed” situation, as a police officer or soldier might be. If one is not dealing with a psychopath. However, ideal situations are often lacking. How then does one apply the Golden Rule? One answer is this: Use the Golden Rule together with critical thinking, analogy and interpretation. These are some of the methods that U.S. Supreme Court Justices use when determining constitutionality in situations not anticipated when the provisions were written. First, the critical thinking category: Think of a very grouchy, sullen, angry, vindictive or otherwise “difficult” person. It’s hard to follow the Golden Rule when one can be quite sure that the other person will respond negatively regardless of how nicely or well he is treated. Here, some critical thinking may help. One can think about reasons why the person is so anti-Golden Rule in his dealings. For example, the person may have been treated very badly when growing up, and he is treating people as he has been treated in the past. If so, he may gradually display a more positive attitude if he is treated nicely regardless of his own actions. Or he may not display a more positive attitude. In this latter case, one still treats him well so as not to be dragged down to his level. One continues to act in ways that will be personally uplifting regardless of his response. If you look the other way or give money to no one, is that a way of following the Golden Rule? Explain. If you give some change to everyone who asks, is there not a good chance that the money will be used to perpetuate a drug problem or keep the person from being motivated to seek a more permanent solution to his or her problems? Explain. Should one give money to some individuals but not to others? Does the Golden Rule help us to make the give-or-not-give decision? If so, how? Are there other ways of responding to such a situation that would be in keeping with Golden Rule standards and allow one to break out of this either/or frame of mind? Explain. Are there other moral standards that should be combined with the Golden Rule in this decision-making experience? Explain. Using the Golden Rule effectively (in a critical thinking way) may mean saying “No” in a rather direct way in order to maintain moral standards or to insure that people do not receive false impressions of interest. In class, students can be encouraged to discuss how they would interpret the Golden Rule when friends suggest dangerous or immoral activities. How would they suggest responding to telemarketers when one is uninterested in buying the suggested product or donating to the particular charity? Is quickly hanging up the phone a Golden Rule procedure in such a situation? If so, explain. If not, what response would be more in keeping with the Golden Rule? Encourage students to share difficult situations that they themselves have faced and have them reflect on how using the Golden Rule might have been helpful at least in the long run. Or, have them consider soldiers in combat. Very often, soldiers practice the Golden Rule with respect to their comrades. But what about the enemy they are fighting? “The enemy” are also human beings. Very few people are so devoted to using the Golden Rule that they will allow themselves to be killed rather than fight or defend themselves. If soldiers practiced the Golden Rule with respect to the enemy, would they not endanger their own comrades? Would they not dishonor their country and risk being court-martialed? To abide by the Golden Rule with regard to one group in this extreme situation seems to mean it cannot be used in regard to another. How would a soldier who believes in the Golden Rule best deal with this situation? A word of caution: Like all seemingly friendly acts, apparent Golden Rule behavior can be used as an exploitative device. The “very helpful person” may be manipulative, trying to make people feel indebted or guilty if they don’t buy his product, support his cause or vote for his candidate. Young children in particular are warned about “helpful” strangers. Nonetheless, the Golden Rule is the most inclusive and altruistic moral guideline that people have in terms of governing their own daily behavior. The Rule is time-tested and when interpreted sensibly, it has relevance for the many kinds of situations that people face. This section contains a number of suggested activities for students as well as some multiple-choice questions. The latter is best used as a review activity, one in which students are asked to justify their selections. Does the classroom atmosphere improve? Are students more willing to tutor classmates? …to help with class chores? In his Golden Rule statement, who did Confucius likely mean by “others” (see chapter #3 of this curriculum)? Who would “others” have meant to an ancient Hindu? To an Israelite? Felix Adler (1851-1933) was the founder of the non-religious Society for Ethical Culture. He proposed this guideline: “Act so as to elicit the best in others and thereby the best in yourself.” (An Ethical Philosophy of Life, 1918, pp. 208-222) In your judgment, is this guideline a useful addition to the Golden Rule? Does it illuminate the message of the Golden Rule? What reasoning supports your answer? What happens in a society if people generally fail to follow The Golden Rule? If the members of a society fail to follow the Golden Rule and social disorder results, can order then be imposed through more and stricter laws? Through harsher punishments? Explain? Are these examples of the Golden Rule? A mentally ill man who hurts others so others will hurt him. Doing to others the bad things that they have already done to you. Doing to others what you think they would do to you if given the chance. Using “An eye for an eye; a tooth for a tooth” as a guide when mistreated. Giving someone a gift hoping that he will give you a more costly one. In your judgment, should Rogers have used the Golden Rule as he did in The Rise of Silas Lapham (see chapter #4 of this curriculum)? Or, do you consider his use of it to be too self-serving? Secure Christmas Books, Tales and Sketches (see chapter #4 of this curriculum) by Charles Dickens. Describe in detail the situation in which Dickens uses the Golden Rule term in The Battle of Life story. What is his moral message? Would you advise a timid boy or girl to use the Golden Rule if picked on by a classroom bully? Why, or why not? Why would the Golden Rule make a more appropriate public school display than the Ten Commandments? Explain. find additional ancient and modern variations of the Golden Rule (there are many). find additional references to the specific “Golden Rule” title that were used in the United States before the Civil War. provide class members with a short biography of one person–mentioned in this lesson–who championed the use of the Golden Rule. provide class members with a short biography of one historical or modern person–not mentioned in this lesson–whose life embodied the Golden Rule. What evidence, if any, can be found to demonstrate that worldwide progress has been made in using the Golden Rule as a moral guide? Explain. Is “following the Golden Rule” all that’s needed to live a moral life? What new perspectives, if any, has this lesson provided for you? Has it caused you to think about your own ways of responding to people and situations. If so, how? If not, why not? Do you already follow the Rule? This section can be used as a review activity in which students are asked to justify their selections. Of the four traditions listed below, whose version of the Golden rule most clearly extends beyond humans to include other creatures that can feel pain? Of those listed, which one was first to clearly state an altruistic form of the Golden Rule along the lines of “do unto others”? Friends and family who are personally known. Friends, family and members of one’s religious group. All of the above plus the citizens of the country in which a person lives. None of the above are correct. One can feel identified with people anywhere in the world. Reduces the effectiveness of the Golden Rule by taking power from nations whose people are trying to live by it. Goes beyond the Golden Rule and thus makes it obsolete. Broadens the focus of the Golden rule by emphasizing human rights, gender equality, racial equality, etc. Is unrelated to the Golden Rule since it does not concern actual people. Answers: 1-b, 2-d, 3-c, 4-d, 5-d, 6-c, 7-c, 8-b, 9-a, 10-a, 11-c, 12-b, 13-a, 14-d, 15-c.
To what extent are mottos such as “Do a good deed every day,” or “Engage in random acts of kindness” similar to the Golden Rule? How are they different? Think about soldiers who lose their lives trying to save their fellow soldiers in combat–or any person who dies trying to rescue others. Are these examples of the Golden Rule? Explain. Do you agree with de Waal’s judgment that these non-humans are able to think and act in simple Golden Rule ways? If you do not agree, how do you see this kind of animal behavior as being different from what we call “following the Golden Rule” in human society? If you agree with de Waal, can you provide other examples from your personal experience or from news items that you have seen or read? 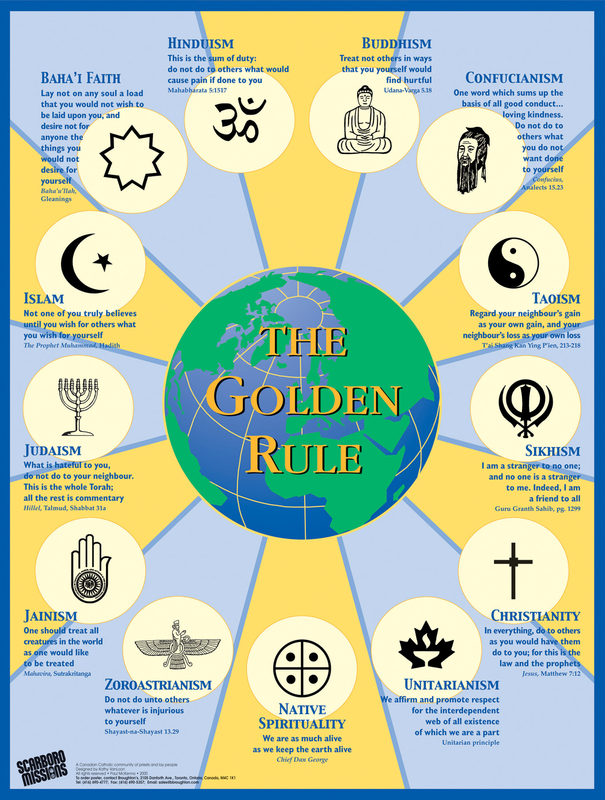 Print versions of this Golden Rule lesson plan are available. The print version is entitled “The Golden Rule Basis for Ethics and Morality” and contains a lesson that was published in the 1879 edition of McGuffey’s Fourth Eclectic Reader as well as a section on how the Golden Rule relates to the Ten Commandments. It is available to educators in the United States and Canada for $1.00 (US funds) per copy. Please add $1.00 per order for postage and handling. Include a check or institutional purchase order. Brant Abrahamson and Fred Smith are career history and social studies teachers who reside in the Chicago area. As they taught, they became increasingly disturbed by the deficiencies of standard textbooks, and they began developing alternative materials for their students. Some of their lessons and units have been published by GSP, Tucson, AZ, and The Teachers’ Press, Brookfield, Illinois, U.S.A., 60513. Abrahamson writes a column for the quarterly Inquiringminds.org newsletter. Abrahamson’s degrees are from Augustana College (BA) and the University of Iowa (MA). Abrahamson was selected as an Illinois Master Teacher. Smith graduated from the University of Chicago (BA) and Northern Illinois University (MA). Scarboro Missions is grateful for the skilful efforts of Brant Abrahamson and Fred Smith and their willingness to post this useful lesson plan on the Scarboro Missions website.